Being a performer has all sorts of benefits outside the stage. For Marielle, it has opened up a plethora of new doors in school and in life. Performing has caused her to find her place in the world but additionally to see it through someone else's eyes. Perhaps her passion has also sparked new ways of creative thought within her. No matter the benefit, Marielle's love for the stage has propelled her to who she is today. Recalling her audition for a solo in her "Third Grade Spring Choral Recital," she remembers walking onto the stage with an attitude as bright as her light-up sneakers. Behind her red curls was a young girl with an incredible voice that found her place in the spotlight and also found out she got the solo that afternoon. As a mouse and an angel in a local production of the Nutcracker ballet, Marielle soon grew an appreciation for its classical music, majestic sets, and flowing dances. She began to love how a story was being told across the stage without a single word being spoken, a truly magical art form. During middle school, Marielle immersed herself in musical theater. For this young lady, musicals were not only a way for her to realize her own individuality but also to learn and see the world through the eyes of other perspectives. Through embracing the realities of the characters she portrayed, Marielle could better embrace her own reality and understand the mindsets of others. In turn, she was able to more greatly appreciate the traits and personalities put forth by those who surrounded her. This stage experience also translated into a more open way of thinking, stellar public speaking, and immense creativity in writing compositions. 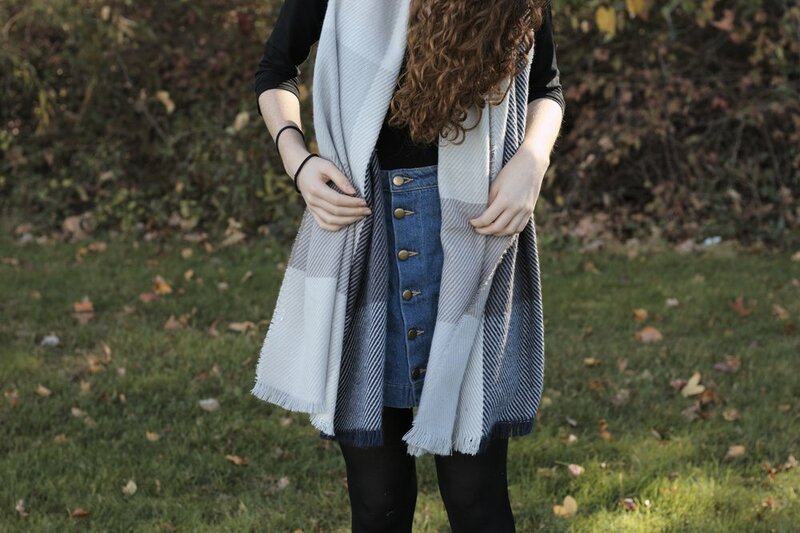 Marielle is showing off her New Jersey fashion and teen fall fashion today. She describes her artsy style as one in which she could wear at a high end European cafe in Paris or in Manhattan's Upper West Side. 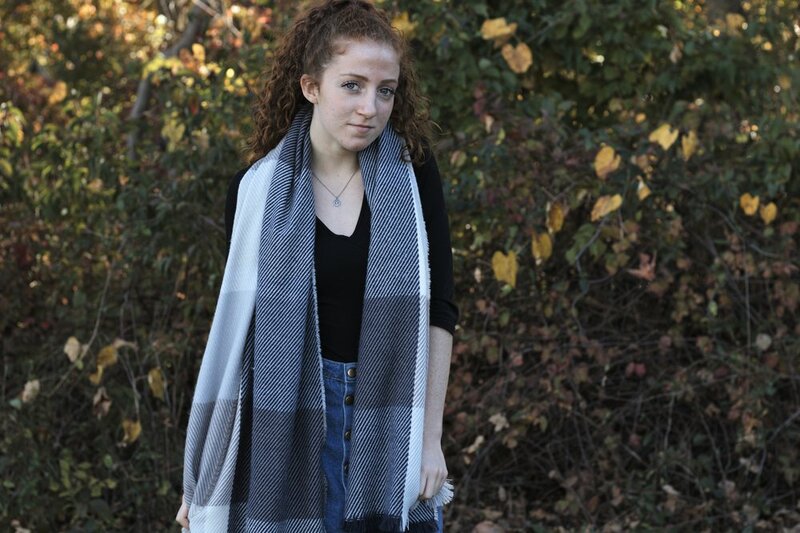 Her women's artsy autumn look begins with a large check scarf draped around her neck that adds a huge amount of character being the outfit's statement piece. She also has on an indigo denim skirt that compliments the theme given off by the scarf. Her shoes are a pair of women's brown suede ankle boots which are a cozy fall must have. Styled with a women's black v-neck top and black tights, Marielle has assembled a truly autumn flavored look.